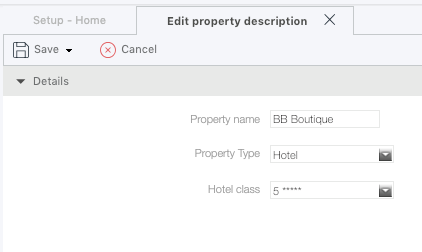 How can I setup my property overview description? HOME > WEBSITE AREA > How can I set up my property overview description? In this field, hoteliers will be able to edit the property characteristics, describing the best they have to offer and also show some images of the hotel. STEP 1: First you need to go to SETUP > PROPERTY DESCRIPTION. In this field, clients can edit the name and the type of the property at any given time. Do not forget to publish your changes, under the WEBSITE tab, by clicking on PUBLISH CHANGES, so that all this information becomes available at your website. This information will be displayed on your hotel overview page, so make sure not to repeat the information inserted here. Under the hotel overview page, you will find a shortcut to this area, where you will be able to edit any information needed.